Akbsteam’s explorations on a Digital Art and Technology MA. It is a wall of containers, built against a hill in Wellington, New Zealand, designed and built by Ross Stevens. It uses the spaces between the containers and the hill to expand its living space beyond that limiting interior dimensions of a standard ISO box. Finland- and UK-based artist-researchers Loca were running their project in downtown San Jose. 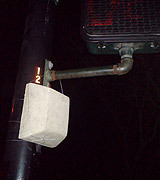 They had molded hollow concrete objects which they attached to various lamps, traffic lights and signposts. Being made of gray concrete makes them effectively invisible which is important because they contain sneaky cargo: inside, there‘s a mobile phone and a power source which lasts around a week. Using a custom software, the phone will continuously scan for devices that have bluetooth enabled and set to discoverable. Every occasion of a tracked device will be sent to the central database and archived there. At their booth they would print out a receipt-style list of the places you’ve been to which in my case was approximately 2 meters long, others were gigantic. Now here comes the fun part: Loca not only collects your data but also tries to combine it with the context of the “urban semantics” it is operating in and tries to draw conclusions from that. Having checked out a few shops and the park for instance, you would suddenly get the message: “You were in a flower shop and spent 30 minutes in the park; are you in love?”. Another thing that Loca do is the tagging of photos according to the electromagnetic context of the device at the time they were taken, i.e. the identities of the nearby bluetooth devices. The pictures they have been uploading to Flickr for some time now contain information about the presence of other's cameras, which already represents quite a history of social encounters, opening a wide field of possibilities for mining and combining the data. There was another work called BlueStates which apparently works in the same direction. IN[ ]EX is a project by a Canadian art group which acts as a nice low-tech approach to the spread of digital information. 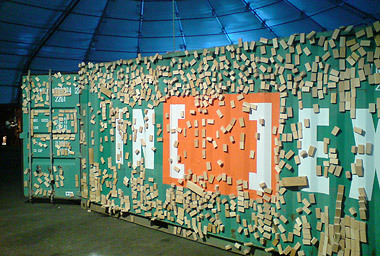 Their piece consist of a shipping container with (initially) 3000 wooden blocks of various sizes attached to it with tiny magnets. There are also a few bigger ones that actually contain sensors for the smaller blocks. 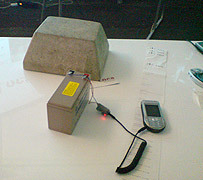 The setup has two functions: a sound installation inside the container which is being generated and influenced through the way that the small blocks are attached to the wall of the container and around the bigger, sensitive blocks. The other part is actually participatory since the artists ask visitors to pick a block and take it with them. Ideally, they should attach it to another metal surface in the city, spreading the installation all over the place. 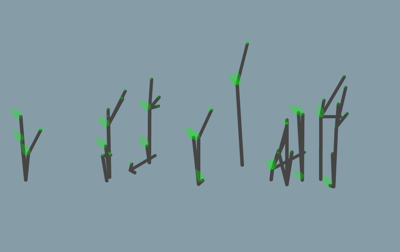 IN[ ]EX is meant to “explore the migration of capital, goods, and people through the ports and public spaces of Vancouver and San Jose”, and the Canadian wood did migrate quite a lot. By the time this photo was taken, almost 1000 pieces were already gone and you would see them in the most absurd places, some people get really ambitious with these things. The exhibition-space at South Hall in San Jose, being a giant temporary tent-like structure, was a bit remindful of the Cargolifter hangar close to Berlin, blimp and blimpsters included! In the past people would store the letters they sent each other in a box and they would order the family pictures in a photo album. After their death, their children would keep and browse through those remains to remember the moments with the deceased person. Today most of us don't write letters anymore but exchange emails. What happens to the emails and other digital data when we die? Michele Gauler's graduation project at Interaction Design RCA is concerned with the role data plays when we remember deceased people. _Digital Remains _assumes a world in which our data is stored on the network creating digital archives of generations of people. Personal access keys are used to log on to the digital remains of a person and receive their data on our own digital devices. These keys, when placed next to a mobile phone, MP3 player or computer, establish a bluetooth connection with the device and trigger a remote log-on to the digital remains of the deceased person they are linked to, allowing a person to access the dead person‘s data. Based on data tags and meta data, search algorithms dig through a deceased person’s data, presenting the content that is most likely relevant to us. For instance, a photograph from a holiday we spent with the person 10 years ago, or the person‘s favourite piece of music which they typically listened to while writing e-mails. The system may bring up emails the deceased read and re-read or it might suggest their own particular way of moving around the keyboard, of naming files and structuring folders. Someone who’s not a close relative, for example, would get only a partial access to the deceased‘s data and anything you don’t want others to know of would become crypted after your death. Michele Gauler's project suggests a way to evoke the presence of the dead person in a very unique way. New forms of technology might engender new ways of mourning. A system exploring a representational method for reading rss feeds where as the system is used it adapts to the usage patterns of the user and by means of an external influence, requires the user to adapt to the system. It is envisaged as an RSS news reader based around an artificial life engine, where the user is attempting by their interaction to keep alive the feeds that interest them. I started looking at RFID when I was a student at ITP, during the spring of 2006 for my thesis project, which was about object annotation (description). I was interested in how we relate to things, what these artifacts say about us, and how they often serve as proxies for relationships with people. I was taken by the idea that there is a story behind every object. 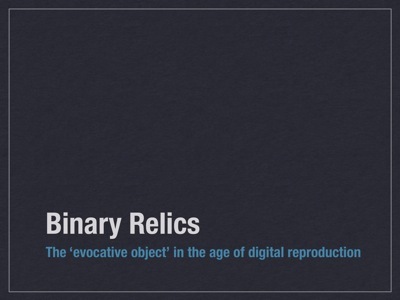 We make and collect physical things — artifacts— that we attach a lot of meaning to. These objects often serve as memory triggers. I was looking at the role of objects (memorabilia, souvenirs, etc.) in storytelling and how digital media can mediate the retelling of memories. I was trying to “embed” personal histories into inanimate objects. I‘m more interested in the narrative — qualitative than quantitative information. I’m more prone to remember a good story than facts and figures. My personal view is that of all the data we record, the most precious ones are stories. These are impressions —- real, reconstructed, or imagined memories — that are a trace of our human experience. Ultimately, the network of things, that they both write about, is connected to a network of people. a place regarded as holy because of its associations with a divinity or a sacred person or relic, typically marked by a building or other construction.  a place associated with or containing memorabilia of a particular revered person or thing : her grave has become a shrine for fans from all over the world.  a casket containing sacred relics; a reliquary.  a niche or enclosure containing a religious statue or other object. the table in a Christian church at which the bread and wine are consecrated in communion services. 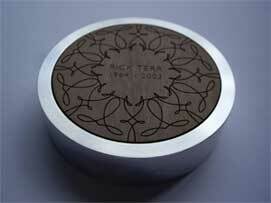  a table or flat-topped block used as the focus for a religious ritual, esp. for making sacrifices or offerings to a deity. lead someone to the altar marry. sacrifice someone/something on/at the altar of someone/something cause someone or something to suffer in the interests of someone or something else : no businessman is going to sacrifice his company on the altar of such altruism. Human beings have a great propensity for storytelling, and for making and using objects. We project value onto an object based on our emotional attachment to it, which in turn is based on our memories associated with it. These objects become cues to our past. They can tell stories about our lives.